Few things in life are as effective as a Rolex marketing strategy. From the company’s very earliest days, when founder Hans Wilsdorf secured the first ambassadors to tacitly promote his products for him, just about the only thing the brand does better than make watches is sell watches. People who know about such things now estimate their annual advertising budget hovers around the $40m mark. So it can be something of a puzzle that with each passing year, Rolex seem to go out of their way to make it more and more difficult to buy something from them. Supplies of their most fanatically desired models are kept artificially low, making it nigh-on impossible for regular consumers to get one through official channels. As a business strategy, it smacks of being somewhat counterproductive, but there is no one who can suggest it has been anything other than spectacularly successful. Come the 1970s and the arrival of the quartz crisis, Heiniger doubled down on his efforts, never trying to compete on terms of accuracy or cost, but instead trading on heritage, reputation and engineering excellence. The prices for Rolex watches began increasing dramatically, making them, to borrow a phrase from a different advertising campaign, reassuringly expensive. Models that had once upon a time been designed to survive fearsome underwater depths or time laps in an endurance race car, were now more likely to be bought as status symbols, the sole preserve of the boardroom or water cooler. Even so, until up around 15-20 years ago, it was still possible to walk into an Authorized Dealer and come out with the piece you wanted, with little trouble. Rolex, as you will know, has never and probably will never sell its watches online. In addition, its sanctioned dealer network are similarly banned from doing so. However, that is only one item on a very long list of things Rolex demands of its retailers. Becoming an Authorized Dealer for the world’s most successful watchmaker is an incredibly daunting process. For starters, it would have to be an established jeweler with a thriving business and a proven track record. It has to be in an approved location, a set distance away from any other AD, and be able to dedicate an extensive amount of floor space for Rolex products. In most cases, it requires a store to be remodeled, including paying for the brand’s design team to be flown in to oversee development, and the work carried out only by an approved roster of contractors. A dollar outlay running into the hundreds of thousands is not uncommon. There are strict guidelines on what materials can be used, adhering precisely to worldwide guidelines in styling and color choice. Wood paneling, for instance, can only be a lacewood veneer with a strong horizontal grain that resembles snakeskin, and panels must fit together with tolerances of less than one millimeter. On top of that, it usually requires at least a $1M buy-in in the first place, with a formidable minimum order requirement for each store every year. It is all in the name of that quality Rolex has long concentrated on—exclusivity. It is reported that AD staff are not even permitted to discuss prices over the phone or by email, only face to face. They want the purchasing of one of their watches to be an event, rather than merely a transaction. With the massive investment involved, it is no wonder those stores which have gained AD status work hard to keep it. 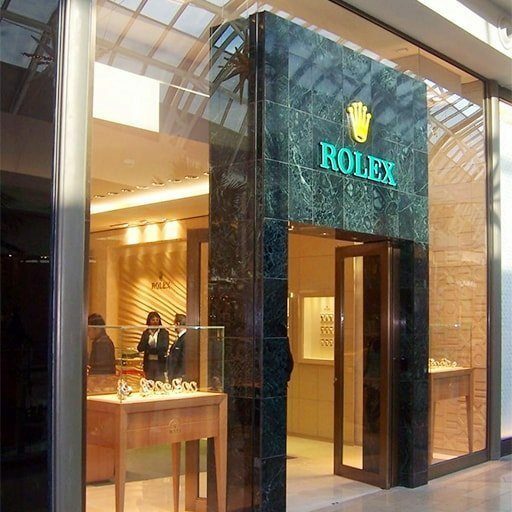 Rolex can and have pulled out of partnerships with retailers with little to no warning, so dealers break from the draconian guidelines sent down by HQ at their peril. It hasn’t always been that way though. Until the explosion in watch collecting in the early 80s, Authorized Dealers had a lot more freedom. Still reeling from the influx of cheap quartz imports from Japan and America, Switzerland’s industry was in trouble. Rolex had weathered it far better than most, particularly the two thirds of traditional Swiss manufacturers that went under during the 70s, but they were still in need of selling as many watches as they could. Dealers had a much freer hand and were able to supply customers with exactly the model they wanted, even with the chance of a discount if they asked nicely enough, and especially if they were buying more than one piece. They could also be called upon, depending on the store, to swap and change various parts of a watch. So, if you had a GMT-Master on its factory-issued Oyster bracelet and fancied turning it more formal with the addition of a President or Jubilee, there was a strong chance your local AD would do it for you if they had one in stock. Contrast all that with today. Take a look in any AD’s window and you will see plenty of Datejusts and Lady-Datejusts for sale, perhaps an Oyster Perpetual or two hiding at the back. If you were after something that wasn’t one of those however, say a Submariner for example, chances are you will be adding your name to the bottom on a long waiting list. If you wanted a new steel Cerachrom Daytona or one of the recently reissued Pepsi or Batman GMTs, you might not even be able to get on the list in the first place. I don’t know for sure, but there may be a waiting list to get on the waiting list. Discounts are also a thing of the past. Rolex’s pricing strategy is set in stone, with pretty much no chance of a markdown of any kind, regardless of how many you’re buying. And as for exchanging elements of your watch with others? Forget it. A Rolex with a non factory-issued part is, in the eyes of the company and their network of dealers, no longer a genuine Rolex. The retailer won’t help you change it, and the official maintenance centers will refuse to service it. Although Rolex’s reputation has never been higher, their policies to ensure their exclusive status have been frustrating customers for a while now. Not being able to buy one of their products within a realistic timeframe and for a reasonable amount of money has also given birth to an enormous gray market industry, retailers that sell new Rolex, usually online, but who have no formal association. It begs the question of just how long the brand can continue in the same vein. They are still, by a long way, the biggest selling luxury watchmaker on the planet, but fans’ loyalty can surely only be pushed so far. Many of the most sought after pieces are now being bought up in bulk by professional investors before they even reach the shop floor, businessmen who have built up relationships with a number of ADs and are given priority over the average Joe, who then sell them on at a steep increase. You can’t really blame the dealers themselves; they have stock that needs to be sold and if they can do it quickly, then all the better. But more recently, some are trying to inject a little fairness back into the process. Methods such as limiting the number of watches one person can purchase at a time to combat the pros, or holding waiting list lotteries by pulling names out of a hat are designed to separate the real fans from those looking to make a quick buck. As for Rolex themselves, they have always been a law unto themselves and we can never tell what they might do next. But the one thing that might help the situation, i.e. simply making more watches for ADs to sell, is unlikely any time soon.